Last week, I discovered a magazine I'd never come across before: Sweet Paul magazine. I'm not sure how I'd never heard of it before (it's for sale in Mecca Anthropologie stores); it's basically all about everything I love: Great design, home decorating, DIY projects and delicious recipes. As I flipped through the pages, I fell more and more in love. It was like I found my soulmate, in print. I discovered the magazine because one of the neat things about my job is I get to page through dozens of different magazines, looking for inspiration. I was "getting inspired" by Sweet Paul mag last week when my coworker James mentioned that he, too, was a huge fan. He told me to check out the magazine's web site, and, more specifically, to check out the dyed mop head wall art project. James said he tried the project out at home and, the way he described it, I just had to see the outcome. 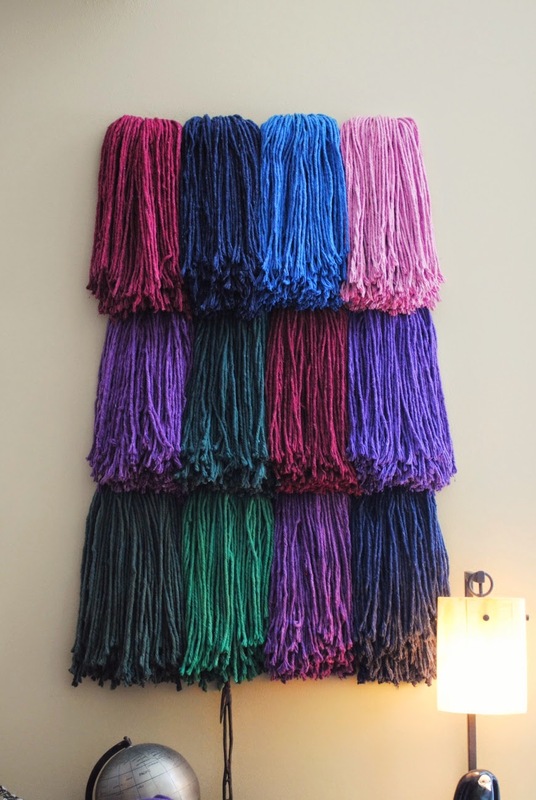 It's funny, you wouldn't think a bunch of dyed mop heads hanging from a wall would be beautiful, but once James sent me pictures of his project, I was floored. It looked amazing! I asked if I could share his photos with you, my friends, and he graciously said yes. Pretty cool, right? I love the texture, the bold colors and the huge impact it makes on the wall. Fabric and woven wall hangings are HUGE right now, and this is a totally creative way to add some major wow factor into your home. And can you imagine these in an ombre effect from top to bottom? So gorgeous. For instructions (which are pretty straightforward), click on over to Sweet Paul mag's web site. But James was kind enough to share some tips that he picked up while making his own installation that should help your process go smoothly from dye to dry. 1. You can pick up simple cotton mop heads at Lowe's in packs of three. James was able to to get those rich colors by using one bottle to fully dye two mop heads. 3. Unless you want to walk around with purple hands for days, use rubber gloves when dyeing! 4. Once everything's been dyed, rinse the mop heads out just until the water runs clear. Don't worry about the post-wash step...you won't be wearing the mop heads (unless that's your thing), so you won't have to worry about the colors running or bleeding onto other garments in the wash.
5. Allow for a full week of drying time before hanging. James recommends moving around and adjusting the mop heads throughout the drying process to help things air out. 6. To hang, "part" the mop heads in half (like you would with your hair), and nail the base of the head (where you've parted the fibers) to the wall. You might want to draw a level line on the wall to make sure everything's aligned just right. Here, you can see James' installation process. Pretty fun, eh? Notice how he fluffed up the mop heads after each row was installed, and snipped any strangling pieces to make things a bit more even. If I had any extra space on my walls, I would totally do this project in my own home. Alas, I've barely a square foot to work with at the moment. But if you try this one out, I'd love to see how yours turned out! (P.S. Check out the totally-awesome version of this project as an Anthro installation). Thanks, James, for sharing your photos and tips. You did an incredible job! Thank you! I was wondering how to dye one for an upcoming performance. This confirmed what I thought, except I would have thrown the mop head in our new washer. Glad to read not to do that! !